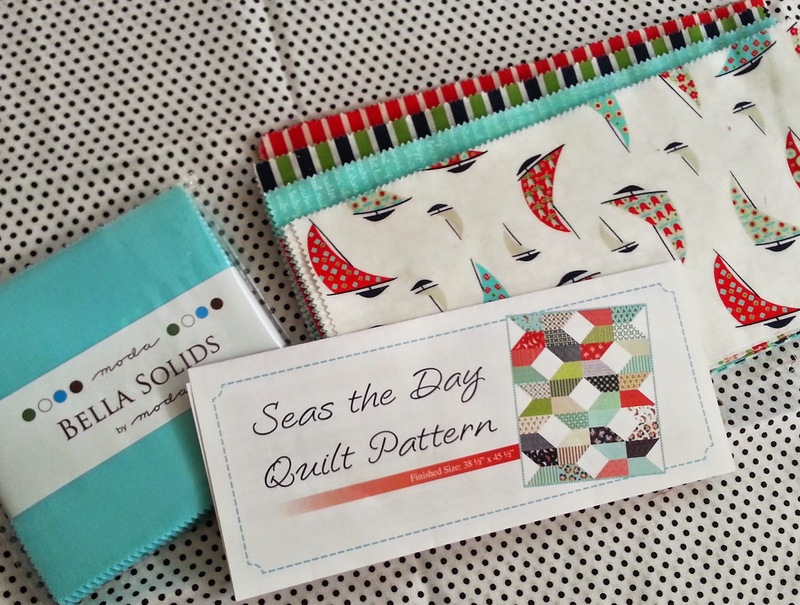 Quilt Story: Seas the Day Quilt! I loved getting to try out this super cute pattern from Fat Quarter Shop! Pattern is free with a YouTube tutorial, kits are available at Fat Quarter Shop. Thank to Kimberly and the team, always creating fun and easy patterns! 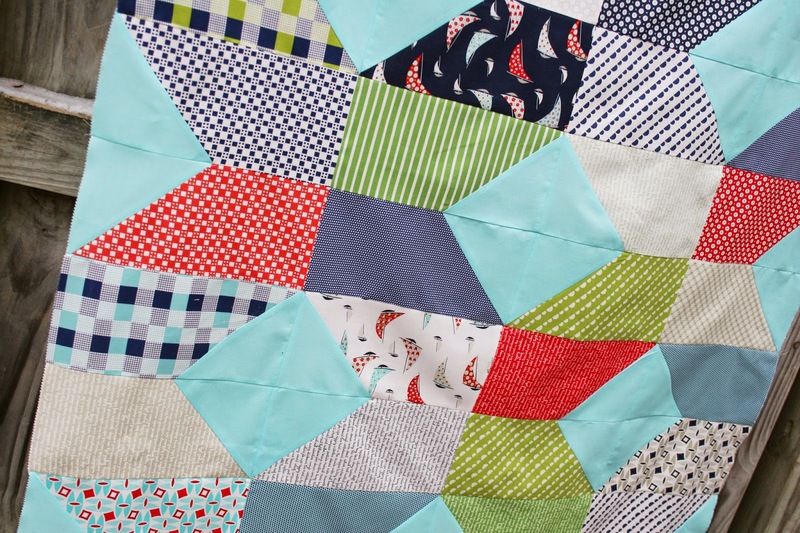 The video tutorial to make your own Seas the Day Quilt! $25 Gift Certificate from Fat Quarter Shop! Hooray! This could get you started on a Jolly Bar project of your own! What is your #1 WIP or project for 2015? Mine would have to be finishing my memory quilt of my dad. I'm a little less than halfway there. I do enjoy working on each block. It can be really hard and sad but I will finish it because I want to snuggle in it. WINNER ANNOUNCED NEXT TUESDAY, 2/17. I started a House quilt early last year. Picking the fabrics and doing the window stitching has been time consuming. But I would love to finish it for 2015. I am also working on a memory quilt of my husband. He passed away in Dec 2013 and I find it very hard to cut up some of the shirts. Those fabrics look great in that quilt. My hope is to finish my NYBEAUTY quilt blocks. A quilt to actually go on MY bed! My sisters quilt that I started three years ago... I have to finish it! I really need to finish my Pam Kitty Morning Dresden quilt. I know I'm going to love it. I just freaked myself out with the applique stuff. Sad to say, my project is one that is a graduation present...June 2014 graduation! I am working on a large rag quilt for my son in law! Trying to find the time to finish it. 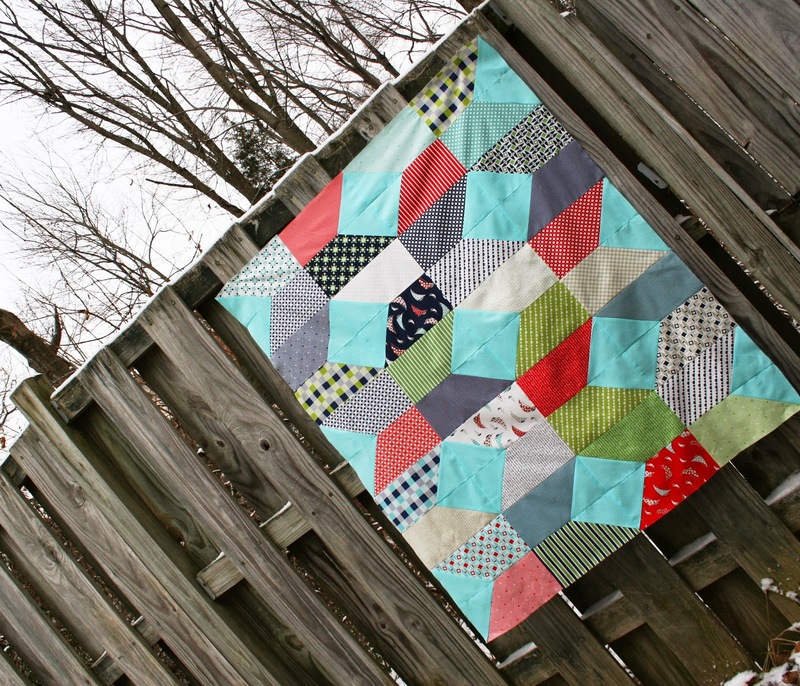 Fun pattern from FQS! They have the nicest quick patterns! My project for the year is a king size quilt. I am using all Bonnie and Camille fabrics that I have been saving up for years and using a pattern from Camille's book Simply Retro. The biggest project I have undertaken so far. Thanks for the chance to win. Love your quilt. That looks like a fun pattern. It is so hard to pick one, I have 4 memory quilts that I have to finish for a friend and her children, my niece has asked for a signature quilt for her wedding, and I want to do a quilt for my bed. Plus 20 other projects that I want to do. But #1 has to be the memory quilts. So I purchased this lovely Hideaway fabric by Lauren and Jessi Jung in 2011 and have been working on a quilt with it since then. I finally got the top together last year, but wasn't happy with the border, undid it and re-did it. Put a back together this year and it wasn't big enough.=( Still working on fixing that problem. It's a huge 90x90 quilt that I think my DH will love. I WILL finish it this year, somehow. I think picking one is hard-I need to get a baby quilt done for a cousin due in May (finished my sister's quilt, who is due next month, before our own little one arrived last week) and for our own house I am really wanting to make a ROYGBIV quilt of some sort! Stash busting is #1 on my list for 2015. A close second is getting my pile of quilt tops quilted. It is a shame that I get to that point (a completed top) and then they sit. It's about time to get them quilted and in use. I just finished a memory quilt in honor of my dad, who passed away in January, but I am making a second quilt like it for my sister. That's my #1 finishing priority for now! I will be finishing the Grand Illusion Mystery Quilt-Along with Bonnie Hunter of Quiltville. My version is 100% dots - every fabric is a dottie fabric. It's a queen size for my daughter. Hopefully that will be finished by the end of February. I started a stack and slash, thought I'd finished it. But I need to remove 3 rows from the bottom, and add it to the side!!! my WIP for 2015 would be Love Entwined, started - not much done and would love to finish more if it but doubt it will get finished - I am working on too many quilts at once. I need to finish a comfort quilt for a friend who lost her partner last year. He was only 37 years old and very sudden. I can't even imagine what she has gone through the last year and this is my way of being there for her. I have been needing to get curtains sewn for the kitchen. The fabric has been sitting next to my sewing machine for a year. I must get them done! Thanks!! What I'd really like to do this year is not just one project but a few is to finish my ufos. I knocked off a few last year so this year it would be nice to catch up on my quilting. I don't have a #1 really...but the custom quilt I am working on right now is pretty important...it will be finished for sure. My #1 for 2015 if to get my just completed 100 city sampler blocks assembled into a top, and then quilted. Your memory quilt sounds wonderful- what a bittersweet process. I have a jacobs ladder quilt that has been lingering for over 2 years that I would love to see finished up this year!!! I am finishing a Lollipops quilt (Fig Tree) in Halloween colors for my daughter with an Oct. 31 birthday. My 2015 project to make my first ever quilt. I've always only made clothing. We bought a King sized bed last year and I have GOT to finish a quilt for it. All of our current quilts are too small! A quilt for my son and a BOM I'm doing. A baby quilt for Rosa who was born last July!! maybe a 1st birthday present?? I started a quilt using the Happy House block from Bonnie Hunter last year. I finally have enough blocks finished so it's time to sash it and sew the top together. I love the blocks so I am hoping to get it done soon. I have a quillow ive been working on for my Brothers kid...I am NOT in love with it and it has sat for almost a year!! I decided to buckle down and get it finished!! I'm so close now!! I WILL get it finished and OFF my WIP list!!! My #1 project is a Buckeye Quilt for my son who is a Freshman in college! It's an extra long twin and it's going to look very cool on his bed. A very dear friend of mine is expecting her first child. This sweet baby girl will be Birm with special needs and will spend many weeks in the NICU. Since this hospital is over an hour from her home mommy will stay at The Ronald McDonald house where the hospital is located. I am making an extra large crib quilt for mommy to wrap up in while holding her baby girl in the NICU. I am embarrassed to say that I have quite a pile of finished blocks ready to put into a flimsy, so I just keep working away at that pile, alot of WIPs! Current WIP is my second Celtic Solstice quilt in blues and browns...its so pretty! I have until Christmas to make a king size black, red and white quilt for my step daughter! My #1 WIP for 2015 is a BOM that I participated in from my local quilt shop. It has 12 12" and 6" matching blocks of 30s fabrics! Thanks for your chance to win! Cute quilt! I have so many WIPs. I guess my first one to finish will be a Fig Tree "Cameos" quilt that has been on my design wall for several months. Thanks for the chance to win. The #1 WIP for me is a graduation quilt for my granddaughter, who is finishing her veterinarian program in May. The blocks are pieced and the sashing is cut. I feel good about the finish by target date. First time on your blog and I've now chosen to follow. Thanks for the chance at the giveaway. I'm working on the Great Granny Squared and I need to make a baby quilt. Thanks for the giveaway chance. A set of Diamond Pillows! My #1 project this year is to help bring my Chinese grandson Nathanael home! To do that, I've been making a lot of quilts for my daughter to raffle and auction off. She's keeping me busy!! But it's wonderful to be taking such an active part in the process. Love this pattern! Thanks for the chance to win! Your quilt looks like great fun to make! My number one priority is a mystery quilt called Celtic Solstice designed by Bonnie Hunter. My quilt guild has a UFO challenge going and this was the quilt I signed up to finish for that. My #1 project for 2015 is to finish a Dresden tablecloth and matching curtains for my kitchen that I started last year. Thanks! To make my very first quilt! I would love to make a queen size quilt for our bed. Have only ever mad lap or baby quilts. WIP: quilt my hexagon quilts. I recently finished my big project for the year: a modern farmer's wife. But right now I'm trying to finish a valentine quilt. Cutting it close, I know. My Hexagon Quilt that is 2 years old, eep..
i am finishing my ufos, one down today. I would like to finish my block of the month quilt I did for 2014. The blocks are all finished, I just need to complete the top. I am making a quilt for my sister who lost her eldest boy in 2012. Using winter's lane fabric and a pattern I have made up myself. A lotta love going into this quilt. And tears. I have a stack of quilt tops to be quilted and my #1 priority is getting them done! Two down, several to go. I have a stack of house blocks that have been in a drawer nearly a dozen years. I would like to get them into a top and finished. I have several baby quilts to work on this year, but is really love to make a quilt for myself finally! I have several quilt tops that need quilting!! An orange peel quilt I started last year. I'm finishing the bindings on 5 Christmas quilts I made - I won't let myself start anything else until their done. I want to finish my flying geese bee quilt from last year! a Mini Kaleidoscope baby quilt for soon to be born granddaughter. I'd love to finish the Farmers Wife blocks and the quilt I'm making with a group of ladies. I'm planning to make at least one of the BOMs in my stash! I need to use the Dutch chintz fabrics that have been in my stash too long. Well, it's not yet a WIP, but I need to make a quilt for my son to give to some friends as a housewarming gift. I want to finish a quilt for my son who is away for his 1st year of college. Super cute quilt! I have a quilt that I need to finish up for my bed. It is a king size quilt and a little bit of a daunting task. I haven't ever made a quilt that large before. I would like to make a throw quilt for my daughter's apartment. 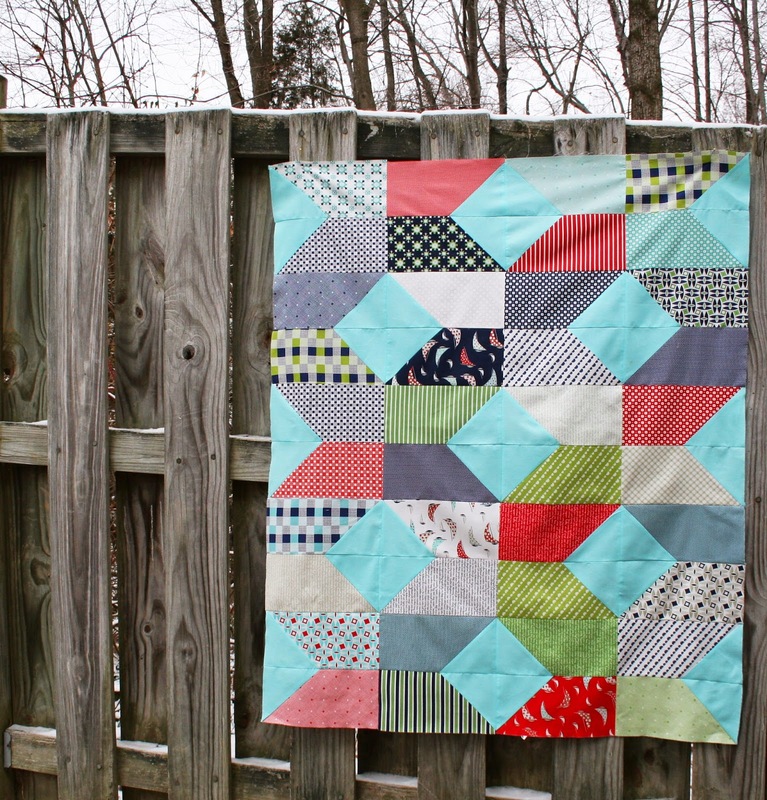 I love how your cheerful quilt keeps the eye moving around! My number one project right now is to complete four weekender bags. I made one for one of my sisters and now the other sisters all want one too. My next project is to make a periodic table quilt for a friend - should be fun! I recently got my oldest WIP basted. I'd really like to get it done soon. I just completed my very first star surround block tonight. I'm hooked! I'm using Winged by AGF and it's going to be for ME!! Lol. I'm hoping to do a block a week but that's kinda wishful thinking I know. Thanks for chance to win this prize! My largest commitment for 2015 is keeping up with an EPP quilt along - the New Hexagon Milefiore - that I am doing. Rewarding, but lots of work. I want to sew together my blocks my fellow guild members made for me in 2013 when I was the president. I have enough to make a king size quilt. Shhhh...don't tell anyone....I plan to have quilts for each of my best friend's four grown kids for Christmas. Each of their kids has received quilts from me (or will have, by the end of the year when the newest have their baby quilts). Now I'm catching up with the middle generation. My granddaughter Brianna's quilt, started last year in a class, I wou like it finished soon to enter in the county fair. I am trying to finish a baby quilt for my fourth grandson, Alex. He will be two in July. I have two Jolly bars coming!! So excited. I have a layer cake and ordered extra fabric through FQS. I Love this line!! I hope to finish 3 baby quilts and hopefully use up a bunch of fabric from my stash. I have two must finish projects for this year both are for my sons. One is a graduation present and the other a sampler quilt. 2 things I have to...yes I must finish up in 2015. I just have the quilting left to do on a quilt for my son and his wife... 2nd anniv.. 8 years ago!!! And a this years quilt I started for a friend...Saturday Soiree... it was a $5 club at my local quilt shop... but theres alot of pieced sashing and alternate blocks.... Yeah, just need to get on with it! My main project is the 2015 Quilt Doodle Design BOM, a twin size with lots of appliquè. Completing a king size quilt made from Kate Spain's Horizon fabric! My number 1# project is whipping my stack of WIPs. I've got several tops that need to be basted and quilted. I started a table runner that I really need to get back to and finish! I have a Carolina Lily that has been looking at me for far too long. I am working on an aqua and gray quilt for my cousin, in memory of her sweet dad, who died recently. I should finish the top in a week! My main project for 2015 is a quilt for my Mom. She lives over a 1,000 miles away and this quilt will be my way of giving her a hug. What a fun quilt! My main WIP is my massive Swoon quilt for our bed. It's been an ongoing project for years and I finally have the blocks finished! So close! My sisters gathered 2014 Row By Row Experience patterns and I plan to make each of them a quilt for Christmas. Going to have to add a Seas the Day baby quilt to my bucket list of quilts I want to make. Eleven WIP's. Trying to finish a wedding signature quilt this month, currently quilting the border, so there's hope! Mine is going to be a Barcelona orange peel quilt! Love your quilt and Daysail is their best line yet!! I have a baby quilt that needs to be pinned and quilted. Been procrastinating! Quilting larger items is difficult for me so I always drag my feet. Love the jolly bars! First I have heard of them. I have two #1 projects for 2015. First I want to finish an Ipad case that my sister started before she passed away in January. I would like to make it into a sewing/embroidery case for my mother. The second is to sew my first throw size quilt. I have been using the only quilt my sister made and it has inspired me to overcome my first quilt fears and just do it. My #1 project is to finish a quilt for my son. He picked all the fabrics, now it's my turn. All the projects for this tour have been great. Thanks for the giveaway. I need to organize and start to use some of my scrap stash! Moving, it really interrupts my quilting time. Hope it is done soon! I just started the Irish Chain Twist QAL at Happy Quilting! I am assembling the blocks and rows for the Grand Illusion mystery quilt by Bonnie Hunter! It is so much fun!! A new quilt for my grandson and a baby quilt for my soon-to-be-born grandson! boy you have a lot of followers! I love the Day Sail fabric, the teal colour is so fresh and young. My work in progress that I would like to finish is a baby quilt I started for my granddaughter. She is one now so I really need to get to this. I sometimes hit a wall when I am not too sure how to do the next step. My quilt shop has a day you can bring in your ufo and they will help you so that is what I need to do! My first quilt on my new sewing machine! I am participating in a row robin with Quilt Guild, keeping me busy! I've got the top of a queen sized quilt done (my first quilt ever and learned my lesson on that!) but I still need to make the back and then quilt it. I have to get it done, and soon! Mine is a tree skirt made from ties from my husband's grandfather (who recently passed away). The trick right now is getting the ties away from the widow, whose Alzheimers is making things difficult. I'm just hoping to make my first quilt this year. My numero uno WIP is to finish up my SECOND super-king-sixed hexagon quilt. There are over 4,000 hand=pieced 1" hexagons, all scrappy fabrics given to me by various pen pals and swaps around the world. This one is for my 16 year old son. When he saw the first one finished(for our room) he asked me to make him one too! I kind of stalled on it since August…that is a lot of hexies to do…but am now feeling the need to get it done! Hi, I'm new here and new to quilting! Love this quilt...especially in the daysail fabric! The jolly bars are a perfect addition to layer cakes, charm packs and candy...super clever of FQS!! Thanks for a chance to win! Oops! Forgot to answer...my WIP is a pillow that I'm making for my mom in memory of her mother. I am new at this and have never made a pillow with a zipper so I need to research first! A birthday quilt for my mother in law who is turning 60. I am starting a quilt along on Material Girl Quilts starting this month and another on Craftsy with Jenny Byer. VERY EXCITED!! I would love to finish my Sweet Pea quilt. I am about 1/2 way through the hand quilting. I do hope you get your memory quilt finished soon so you can again be close to him. You're lucky to have had such a loving father! My #1 WIP is finishing a small heart quilt that I started weeks ago. I want to finish it tomorrow...just in time! I have 2 big ones. I need 3 quilts for my great nephews and then a Red and White log cabin. I would love to finish my farmers wife quilt this year that I'm making from Bonnie and Camille scraps. Can't wait to see the finished quilt! I'm aiming for the full size so may take a while! I like, I like! My #1 project this year is to finally get Sunshine's 100 Good Wishes Quilt made. Her brothers has been done for a while and hers is long overdue. My main quilt to begin and finish this year is a Hexie quilt called Just Judie by Judie Rothermel. My first hex project, and I am excited about it. Would love to win! Thanks for the giveaway. My number one priority this year is to finish hand quilting my husbands quilt. I'm trying to keep it a secret, so it's been several years in the making. But 2015 needs to be the year I finish it! Thanks for the chance to win! Finishing my sisters wedding quilt! It's the biggest quilt I've worked on yet and takes so much space to lay it out to make sure my final layout is good. That's what's holding me back it's so silly! My main priority right now is not actually a quilting project. I'm making my twin granddaughters spring outfits for vacation. After those are finished, I'll be working on block totes for the family. I have only a few small WIPs in my sewing room. I'm starting a new quilt today! I don't know what it is yet. IT will be the first pattern that inspires me this morning. Right now my number one is a Jacob's Ladder. My quilt guild is having a quarterly challenge to finish one UFO each quarter. The challenge has me motivated to get things done. My number one is my son's Minecraft creeper quilt. Get UFOs done and quilt my granddaughters quilt. My WIP would be quilting the tree skirt from last year so I can use it THIS year! ha ha! My #1 wip is to finish my very first quilt. My #1 WIP is a child's birthday quilt. My WIP is a quilt using April Showers by Moda. I have to finish so I can buy Daysail! I would really like to finish my Egg Basket Quilt I started many years ago! My WIP I'd like to finish is a tumbling block scrappy quilt! I started it last januart and its EPP so it takes forever. I'm about 40% done. then I'm going to hand quilt it. A Christmas quilt for my daughter. Hopefully this Christmas. I am excited to have my first online bee quilt! On my "To Finish List" are the Denyse Schmidt quilts for my son's bed - I sat quilts because he has a bunk bed and I am doing two at a time! A new quilt for my bed that I just started. I'm using The Boat House collection by Sweetwater. Thanks for the chance! I finished two of my quilts that were UFO's. and I started and finished two others. Yippie! The Project for 2015 I want to get started, is a special quilt, for our Son's new Home! :) And to finish a quilt for our Daughter! I don't actually have it started let alone a pattern or fabric picked out but I finally want to make a quilt for my bed. Finishing up my Celtic Solstice from 2014! :) thanks for the chance. I'm a newbie to quilting but really love the colors of the jolly bars can't wait to start my new advanture. I want to make a very special quilt for a great grand child which is due in July. I tend to finish what I am working on before I start anything new so I don't have a WIP at the moment. I am currently sewing for a friend to help out with the cost of her wedding by sewing 28 table runners 8 ft long, and miles and miles of bunting. If I get the chance to start a blue and white quilt that I have in my head I would love to finish that this year. First, I'm not a blogger, not sure how that happened. I want to make a full size quilt when I finish this baby quilt I'm making for my niece's new baby boy.